More than 57 percent of U.S. households has one or more companion animals. You probably know that living with a dog or a cat is beneficial to your health. That knowledge is confirmed thanks to a study conducted by Sandra Barker, PhD, professor of psychiatry, and director of the Center for Human-Animal Interaction at Virginia Commonwealth University. In the U.S, more than 57 percent of households live with one or more companion animals. We dote on our pets, and in return they provide us with companionship and unconditional love. Dr. Barker found that pets help us avoid loneliness. 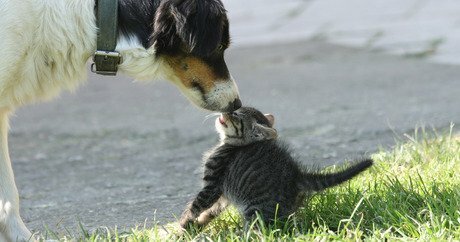 Dogs and cats allow us to focus on them, not on ourselves. Dogs are especially good for interacting with others, since we need to go out and walk them. Having a cat to talk to allows us to interact and care about another living creature. Dogs also help us stay in shape physically and mentally. A 15-minute walk three times a day gets you up and about, and off the sofa. Most people walk their dogs three times a day. When you go out with your dog, you are opening up your world to meeting others. Often people stop dog walkers and talk to them. You are more approachable with a dog at your side. “A study in Japan showed that people who walked dogs were healthier than those who walked alone,” says Barker. Exercising with a dog or a cat can lower your chance of getting osteoporosis. Taking a dog for a walk, tossing a ball, and running around your house with your cat are good forms of exercise. Exercise strengthens bones and can help prevent osteoporosis. Having a pet makes us feel happy. The level of cortisol, a hormone associated with stress, is lowered when we pet animals. Plus, the production of serotonin, an important chemical associated with well-being, is increased.